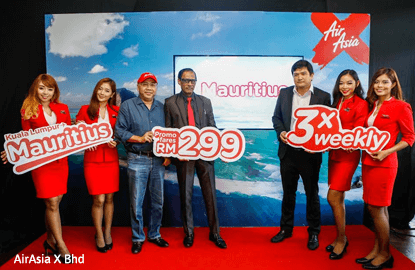 KUALA LUMPUR (May 25): AirAsia X Bhd (AAX) will operate three times weekly flights from Kuala Lumpur to Mauritius on Oct 4. In a statement today, the long-haul low-cost affiliate of AirAsia Bhd said it will mount the Airbus A330-300, which has a capacity of 377 seats, on the route, which marks AAX's 22nd destination in the world. In conjunction with the launch, AAX is offering introductory all-in fares from as low as RM299 one-way on standard seats and from RM999 one-way for its premium flatbeds for booking from May 26 to June 5. "These promotional fares will be available online at airasia.com, as well as AirAsia's mobile app on iPhone and Android devices, and the mobile site mobile.airasia.com. The travel period for this promotion will be from Oct 4 to May 22, 2017," said AAX in a statement today. At 4.15pm, AAX shares were traded down one sen or 2.5% at 39 sen, with 115.05 million shares done. The current price gives it a market value of RM1.62 billion.